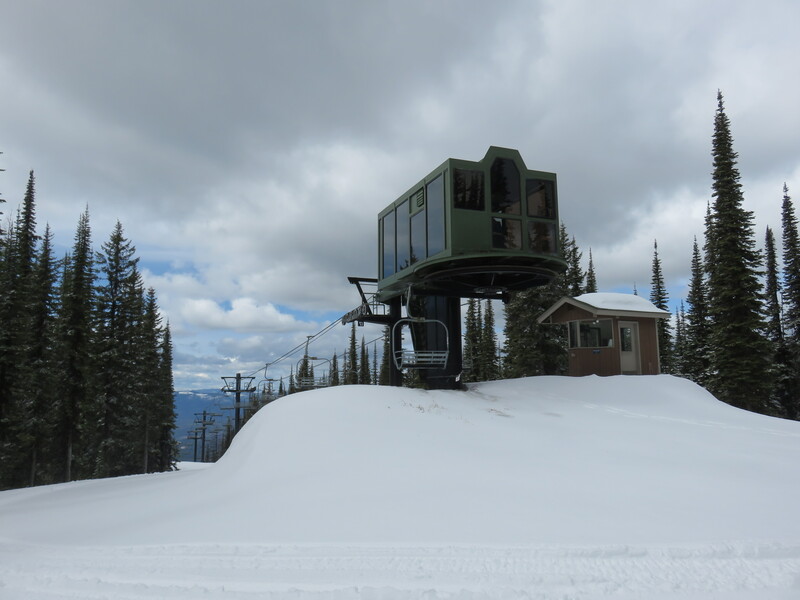 Under a new concept, Whitefish Mountain Resort would remove the current Hellroaring triple and build two new lifts at higher elevations. Lift lines are approximate. Following record attendance last winter and its most successful season pass sale ever this fall, Whitefish Mountain Resort is looking to better disperse guests across its 3,000 acres. Under a plan submitted to the Forest Service yesterday, the closest ski area to Glacier National Park would move one lift and add another in Hellroaring Basin. The generally west facing drainage is currently served only at the bottom by a 1985 CTEC triple. It loads at just 4,675 feet above sea level and offers only one trail for direct repeat skiing. Hellroaring closes annually on April 1st to give waking Grizzly Bears peace and quiet. On the heels of the successful Chair 5 realignment, Whitefish would like to move Chair 8 to begin at the junction of Hell Fire and Glory Hole, a spot known as Grand Junction. The upgraded triple would unload near the top of the 1,000 Turns run, approximately 300 vertical feet below the Big Mountain summit. It would be steep – around 2,900′ long by 1,050′ of vertical – with a seven minute ride time. This would be the CTEC’s third home; it was Chair 7 from 1985 to 1997 before moving to Hellroaring. The current lift line and lower portion of Hell Fire would be permanently closed and rehabilitated to a natural state. 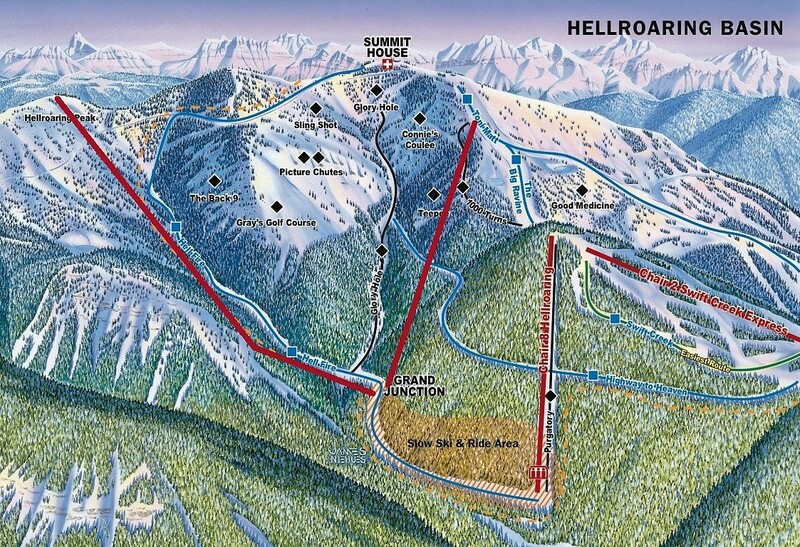 “We are excited to begin the process of possible future improvements in Hellroaring Basin,” Whitefish Mountain Resort CEO Dan Graves said in a press release. 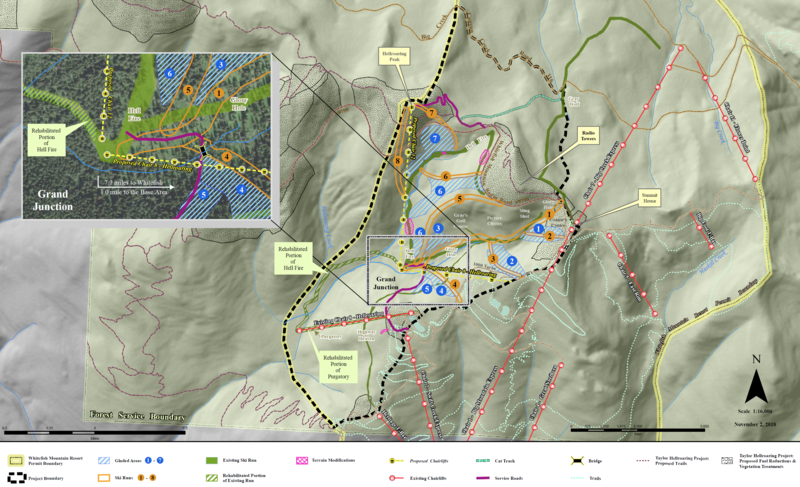 “The Hellroaring Basin improvement project will increase access, and add improved slope variety. Additionally, relocating the Hellroaring chairlift would allow riders to access more terrain than its current location therefore creating better flow around the mountain.” The Flathead National Forest is soliciting public comments on the proposal through November 20th. Forest managers will analyze it over the winter and expect to make a decision next June. If approved, implementation could take two or more construction seasons at Whitefish Mountain Resort’s discretion. The looker’s right alignment is stupid. It still doesnt get you all the way to the top so just like now you have to go all the way down to the Big Mountain Express to return to the top. It should go all the way to the summit. The looker’s left alignment makes sense and would be a great addition. I think that’s an overly harsh assessment for Chair 8. For openers, the new alignment will 100% represent an improvement over the current one. It accesses a far larger swathe of lapable, north-facing, higher elevation terrain than the existing configuration. I don’t think that point is arguable. When the new chair to Hellroaring Peak is completed, the vast majority of the Basin will be lapable via a short gravity traverse. A higher % will be lapable for those who want to work a bit harder. And I’m not sure you want three lifts offloading at the summit given trail capacity up there. Moreover, offloading at the summit would increase the length of the lift by over 50%, stretching to just under a mile. Not sure it’s mechanically feasible, nor marketing-savvy, to convert the current Chair 8 into an 11 minute ride. So you’d definitely be looking at a new chair, and likely one that a detatch in order get that ride time down to something manageable. And that’s another $3-5M on top of what they’re already investing in this area. This is how smart independent resorts are operated – they are getting 90% of what they might ideally want for a fraction of the cost. I think their track record in terms of skier visits speaks for itself. Not only what Mike said about length and practicality, you also have to think about skier traffic and wind. Whitefish gets hammered up top, and any alignment to the summit would be on frequent wind hold. Additionally, having terrain be accessed from a multi lift trip is not a bad thing. Aside from preserving legs better, it also does wonders for snow quality. It’s not a coincidence that Honeycomb’s far wall holds up much better than Here Be Dragons, Navarone, Evergreen or the Powderhorn to Summit shots at Solitude do. Personally, I think this is a great plan, and the additional elevation should also help with snow quality early and late season. No – it’s going to be moved to the new location uphill of the current alignment.